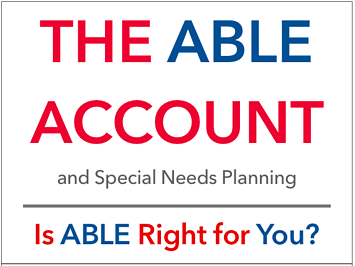 Adults with disabilities become eligible for social security at age 18. Social Security (SSI) provides adults with disabilities a monthly benefit payment and health insurance if they meet a low income and asset threshold. To maintain eligibility for SSI benefits, an individual cannot have more than $2000 of resources in his or her name. This includes cash, bank accounts, stocks, and U.S. Savings bonds. Prior to the child's turning age 18, and before applying for SSI, make certain that the child meets this requirement. One strategy could involve transferring money to an ABLE account as this can help reduce savings beneath the $2,000 threshold and avoid the spend-down process. During the settlement of an estate, the personal representative (PR) (may also be known as the executor) of the estate discovered one of the beneficiaries was receiving government benefits. While this person could definitely use the funds to pay for furnishings in her home and some much needed dental work, if she received the inheritance directly, it would disqualify her from the important benefits she was receiving, as it would bring her above the $2,000 asset limit she is allowed. The personal representative was required to distribute $33,000 to this beneficiary prior to the projected closing of the estate in February of the following year. In discussing the current situation with the beneficiary and the PR, we discussed options for the purpose of educating the parties involved of establishing a 1st party supplemental needs trust (also known as a d4A or Payback trust) where the beneficiary could transfer the entire inheritance to the trust and continue to receive her benefits. We also discussed the option of distributing a portion of the inheritance this year and then again next year using an ABLE account. If the PR distributed $18,000 this year, the beneficiary would be able to buy new furnishings that she needed with about $2,000, get the needed dental work for another $2,000, and deposit $15,000 (2018 limit) into an ABLE account, assuming she had made no prior deposits into the ABLE in this year. The PR would then need to make the final distribution of about $15,000 to the beneficiary by the February of the following year. If the PR does this, the beneficiary could then keep $1,000 in her savings account (still under the $2,000 limit) and add an additional $15,000 to her ABLE account. The beneficiary would then able to use these funds for qualified disability expenses as needed without losing her SSI income and other benefits. Because of the amount of the inheritance, she did not need to go through the expense of hiring an attorney to establish a 1st party supplemental needs trust, find a trustee, file taxes, and then have to ask someone for money when she needed it. She was already living independently and managing her own expenses fairly efficiently. The ABLE account allowed her to continue to receive her benefits and use the funds in the account as she needed them. Content in this material is for general information only and not intended to provide specific advice or recommendations for any individual, nor intended to be a substitute for specific individualized tax or legal advice. We suggest that you discuss your specific situation with a qualified tax or legal advisor. There is no assurance that the techniques and strategies discussed are suitable for all individuals or will yield positive outcomes. The experiences described here may not be representative of any future experience of our clients, nor considered a recommendation of the advisor's services or abilities or indicate a favorable client experience. Individual results will vary. Investing involves risk including loss of principal. Prior to investing in an ABLE account, investors should consider whether the investor’s or designated beneficiary’s home state offers any state tax or other benefits available for investments in such state’s ABLE program.